This blog was supposed to be posted last Friday, the 20th, because it was National Cheese Lover’s Day. I obviously am late, but the recipe is just as good to celebrate now or anytime because it’s so good. I love selecting recipes from cookbooks that have an unusual name, hopefully with a story to explain the meaning. Unfortunately, I could not find out who Lulu might be, or if it even referred to a person. 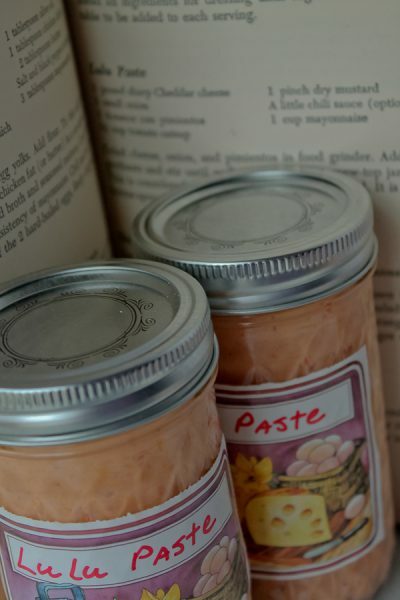 All the author said about it was to grind the ingredients in an old food grinder and store the spread (paste) in a “screw-top jar in the icebox.” Apparently, it is considered an heirloom recipe from Richmond, Virginia. Perhaps someone reading this is from Richmond and can enlighten us on the origin of Lulu Paste. I googled it but came up with nothing, except for several other recipes for that were more recent and used cream cheese instead of cheddar. I think this version must be more authentic as the cookbook is from 1961. 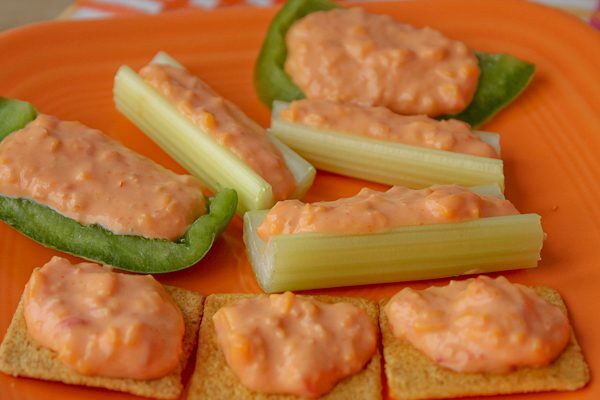 Lulu Paste is similar to the more familiar and ever-popular pimento cheese, but has the addition of some ketchup and a touch of chili sauce which makes it not quite as thick although it does become more firm as it chills. It’s so good spread on crackers, served with vegetables as a dip, over baked potatoes, on burgers, or a sandwich spread. My favorite choice is simply on celery. I love this cookbook! Since my youngest daughter now lives in the Deep South, collecting Southern cookbooks has been a favorite pastime lately. 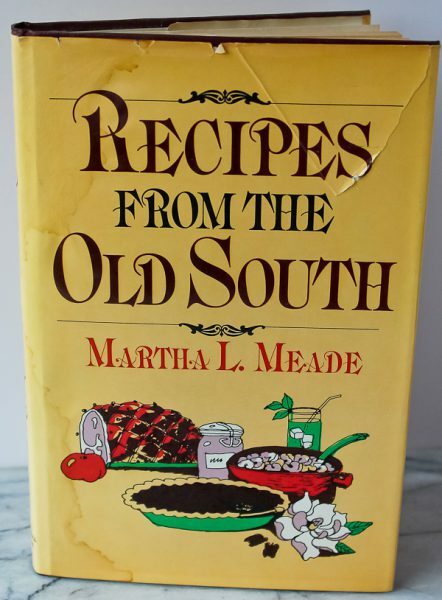 Recipes from the Old South is one of my favorites. The recipes are very traditional and authentic, such as spoon bread, buttermilk biscuits, crackling corn bread, hush puppies, big soft rolls, country ham, fried chicken, all kinds of recipes using crab and shrimp, incredible cakes and pies, fruit desserts, and candies. The recipe makes quite a bit, enough to have on hand for the next football game or the Super Bowl. Grind cheese, onion, and pimientos in food grinder. (I used a food processor on pulse setting). Add remaining ingredients and mix until blended. Store in jars or other airtight container and refrigerate. Serve with vegetables and/or crackers as a dip, as a topping for baked potatoes or hamburgers, or as a sandwich spread. I just love your labels! Old cookbooks are such a treasure! Lynne, I agree. Old cookbooks are the best! I love those labels too, and wish I could remember where I found them. I would love to have more, and there are others that came with the pack with equally adorable drawings. They have been in my “label box” forever. 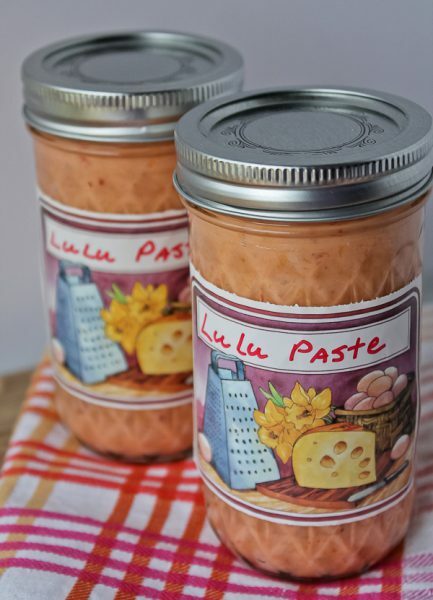 Well this looks delicious and as a huge fan of pimento cheese I might have to give old Lulu Paste a try. Lisa, I am a huge pimento cheese fan too, and was wary of Lulu Paste because of the addition of ketchup, but you can’t even tell it’s there except for the slight change of color. It’s really good and I would make it again.